In January 2010, the Federal Highway Administration and National Park Service Road Inventory Program took possession of a Pathrunner vehicle, built by Pathway Services – Tulsa, OK. 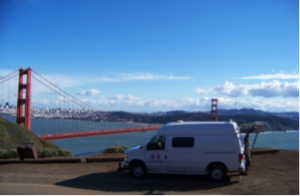 This vehicle or van collects data on paved roads on National Park lands. This data consists of highly accurate distance/GPS, HD video (think google streetview), and most importantly- the distress of the pavement for roads existing in National Parks. The data collected is used on a local/park level for inventory and pavement distress levels as well on a national level for guidance in establishing funding levels for roads. This vehicle is actually a base model Ford E-350 van that has had a significant amount of custom fabrication. Three HD cameras work in tandem with the GPS and distance measuring instrument to allow for precise measurements from the video to be made. The distress of the pavement is measured in three components, the roughness of the road or longitudinal profile, the rutting along the road or transverse profile, and the cracking/patching on the pavement. The roughness and rutting are measured using the latest technology with lasers and cameras. The cracking is measured with a high-powered camera illuminated by lasers (natural lighting is not consistent). The pavement images are then post-processed to automatically detect cracking and severity of cracking. All of three of these components of pavement distress go into a series of algorithm that will calculate a Pavement Condition Rating or PCR that is assigned at different levels of distance from a 0.02 mile/per route level all the way to park wide total level. There are four PWT employees contracted by FHWA to perform a 2-fold process. First to plan the park collection effort, execute the collection effort, and manage the data prior to sending to Pathway Services for post-processing of distresses. Second, the quality assurance of the data after post-processing and prior to delivery to the park. Mike Walker and Jeff Beal head up the collection processes, while Paul Poston and Jennifer McCollom are tasked with the quality control aspects of the project.